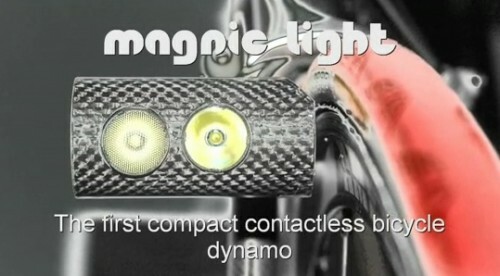 Magnic Bike Light Makes Power Without Touching Your Wheel | OhGizmo! By David Ponce on 02/23/12 • Leave a comment! Magnic Light works with all kinds of metallic rims (normally aluminum, steel or magnesium). While aluminium and magnesium are not magnetic (but paramagnetic) they are conductive. Relative movements of magnets and neighboured conductive material induce eddy currents in the conductive material – in our case the metallic rim. These eddy currents have their own magnetic fields (see Wikipedia) which are absorbed by the Magnic Light generator kernel and by this way produce electric energy. Although there is no friction the absorption of magnetic fields has a minimal braking effect, so we don’t get energy for free. Magnic Light contains the most efficient LEDs currently available (CREE XM-L T6) to get maximal light from minimal energy. So, it looks pretty nice, doesn’t touch your bike and lights up your path. What’s not to like? Well, the price for one. The back light is $85 while the front is $130. And… well that’s it really. Maybe if the little bit of innovation were seeing here is your thing, hit the link and pledge away.